We have been inundated with rain (no complaints here!) over the last three weeks — we received close to 6 inches of rain at our house. The temperatures have been cooler (relatively speaking), mid to upper 90’s for highs and low 70’s for lows—Spring-like for Texas. With rain and cooler temperatures, the insects appear. Insect damage to plants can be as devastating as poor environments and microbes. 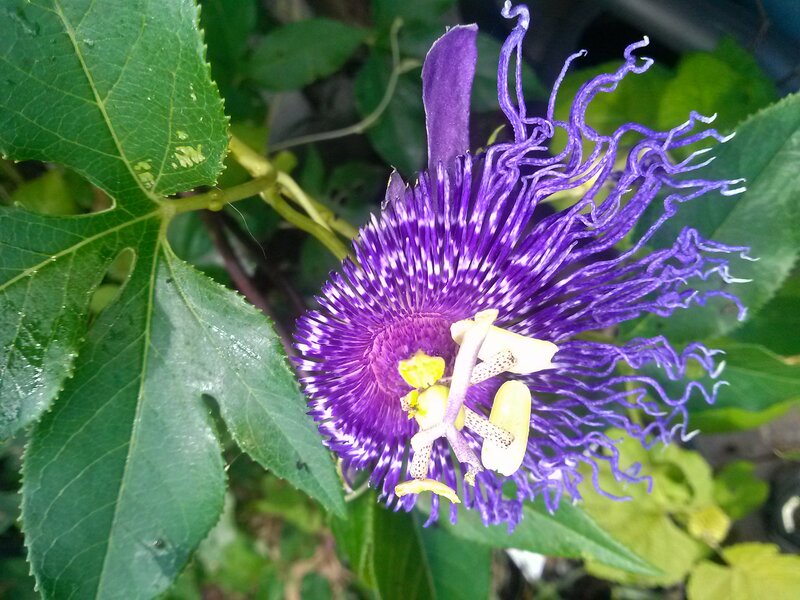 The Passion Vine is one the newest additions–and one of my favorites–in my gardens. In the picture to the above right, the intact, opened flower reveals no damage to the flour parts. By inspecting the plant closer, I was able to identify the exact culprit –a caterpillar voraciously consuming what remains of another flower (next picture down). 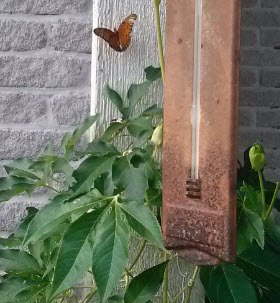 A few days earlier, I noticed a butterfly landing on the passion vine, and took a picture of it. 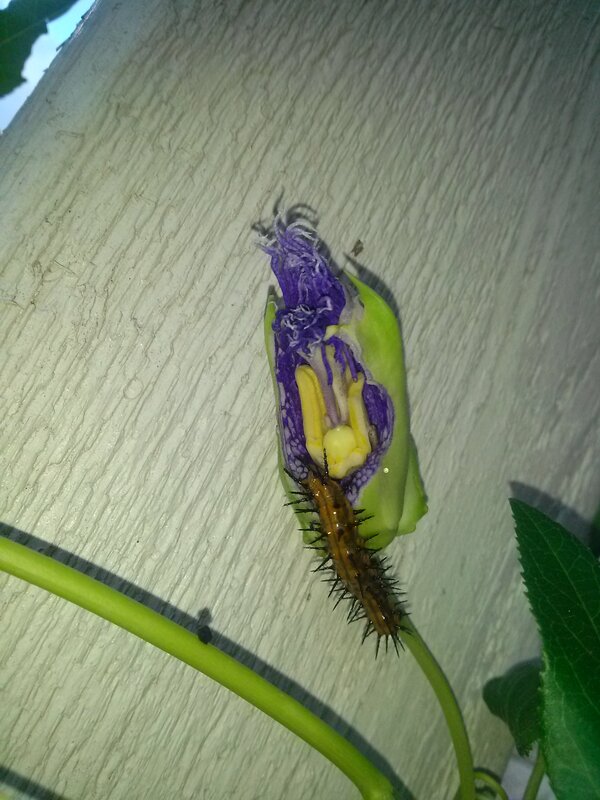 With a little investigation, I think I may have a Gulf Fritillary butterfly and caterpillars — passion vine is a food source for caterpillars of that butterfly. The bottom picture is the butterfly. 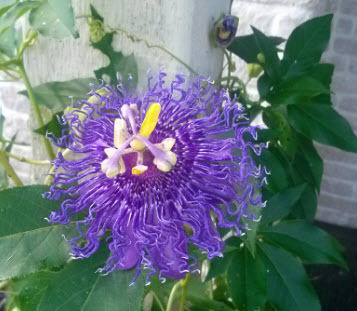 The caterpillars did not appear to be eating the leaves or stems of the passion vine, so I’ll keep an eye on the vine to make sure that it’s not being destroyed by the caterpillars. Also, there’s a cold front on the way — lows in higher 40’s to low 50’s, so the insects won’t be able to damage the vine much longer. My choices for control are; a) spray insecticide, b) remove caterpillars from flowers/vine c) do nothing. I want this vine to survive — it’s only been in the ground for a few months — so I’ll definitely watch for signs that survival of the plant is threatened. If the leaves and stems are not being consumed, it will be interesting to get additional pictures!